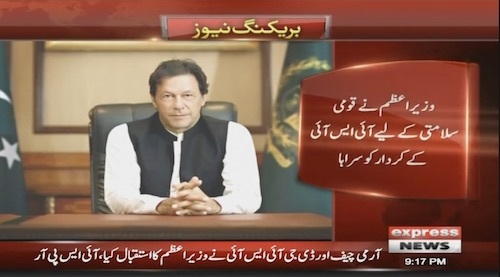 Prime Minister Imran Khan on Wednesday visited the headquarters of Inter-Services Intelligence (ISI). 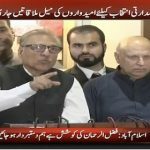 Information Minister Fawad Chaudhry informed that prime minister was given an eight hours comprehensive briefing on the national security. 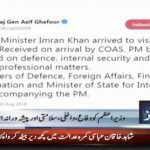 Chief of Army Staff (COAS) General Qamar Javed Bajwa and Director General ISI Lt General Naveed Mukhtar welcomed PM Imran Khan on his arrival. Senior cabinet ministers were also presented with the prime minister. Prime minister was comprehensively briefed on different strategic intelligence and national security matter at the ISI heaqquarters. Imran Khan hailed the contributions of ISI for national security, especially in the ongoing counter-terrorism effort.